Sacroiliac Joint or Pelvic Misalignment? I have lower back pain, seemingly originating on the right side at the top of my SI Jt. I have pain and tension going up my back on the right side close to the spine. It seems to get worse after lying in bed at night and I wake up several times a night with a sore stiff back. X-Rays show narrowing and compression of the lower lumbar vertebrae contracting to the right. I have been told that my pelvis is out of alignment. No pain down my legs but a tightness down my left buttock sometimes. I do yoga and am very flexible but find that the condition is sometimes made worse by twist positions. The pelvic tilts feel good. Do you have any recommendations? Stop doing Yoga! For the time being anyway, and see if you start to feel better. Yes, avoid twisting motions as well for the time being, and focus on strengthening the SI Joint as you may have overstretched the muscles and ligaments in the SI Joint, which may be causing the pain and pelvic imbalance. The pelvic tilts probably feel good because they are strengthening the deeper abdominal muscles, helping to strengthen the pelvis and gently stretching the lower back (lumbar area). I would recommend beginning a good SI Joint Strengthening program. This page shows some good ways to strengthen the SI Joint using some of the Pilates Side Kick Exercises. Remember to keep the hips aligned and Pelvis very still as you do these. This page has a question similar to yours relating to SI Joint Pain. prone position for back extension as they can help strengthen the muscles of the deep buttocks and gluteals that support the SI Joint. When doing these follow the instructions on the above link and also add a lower leg circle in the prone position keeping the pelvis very still as you rotate the leg each direction for 6-8 repetitions. Keep your hip bones and pubic bone on the floor as you do these to stabilize the pelvis. 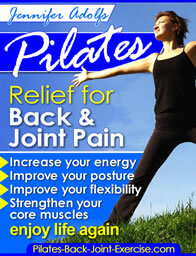 All of these exercises and more can be found in my Newly Revised Pilates Ebook here. The Ebook has 3 levels of progressions and takes in to account back and joint conditions as well.